BASES is Nielsen Innovation Practice. 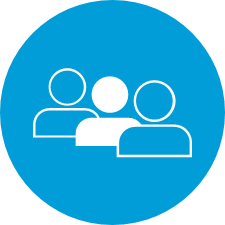 Go through the module to learn more about your role & responsibilities in Nielsen Innovation. 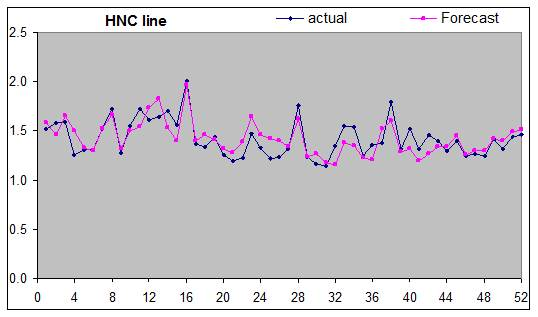 Gen-3 is a forecasting model which is currently used for general restage forecasting studies and is also used for all DecisionPoint forecasting. Choice share is the probability consumers will purchase the tested item the next time they purchase the category assuming the product is available at base price with base level shelf presence. Gen-3 uses the NBD-Dirichlet theory to combine the two probabilities. It is important to differentiate choice share and the probability to purchase. Choice share is just probability to purchase the item... when consumers shop the category! If consumers are aware of the product. For a new item, when consumers shop for the category, the probability that they become aware at shelf and immediately buy (Non-aware trial) is lower than if they are already aware of the product via previous media or shelf exposure (aware trial). If consumers have tried the product. For example, choice share among triers, non-repeaters (1st Repeat choice share) will be higher than among non-triers if the concept is weak but the product is strong, and vice versa. Click the images below to understand Choice Share definitions. How do we estimate different choice shares at the base price (with average level shelf presence) for new items? Non-Aware Non-Aware Trial Choice Share For new item, the choice share for state 1 ( non-aware ) will be small, and default is the aware trial choice share adjusted downwards by the probability of becoming aware at shelf. 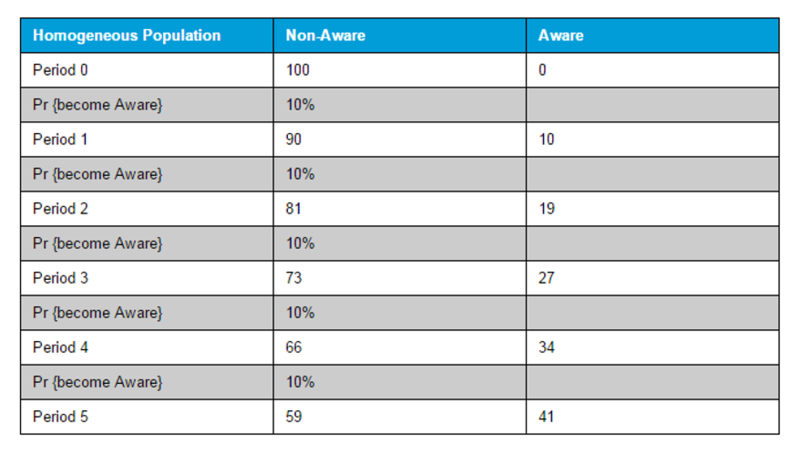 Aware, Non-Triers Aware Trial Choice Share We show consumers the concept stimulus, thus they are aware of the concept and it can be used as a surrogate to reflect the aware trial choice share. For Decision Point/Virtual Launch, choice share can be found in the simulator. Triers First Repeat Choice Share In a BASES II forecast, we let consumers try the product, and they have tried once, thus the key measures can be used to reflect the 1st repeat choice share. Repeaters 2+ Repeat Choice Share We assume this is the same as State 3 (First repeat choice share). 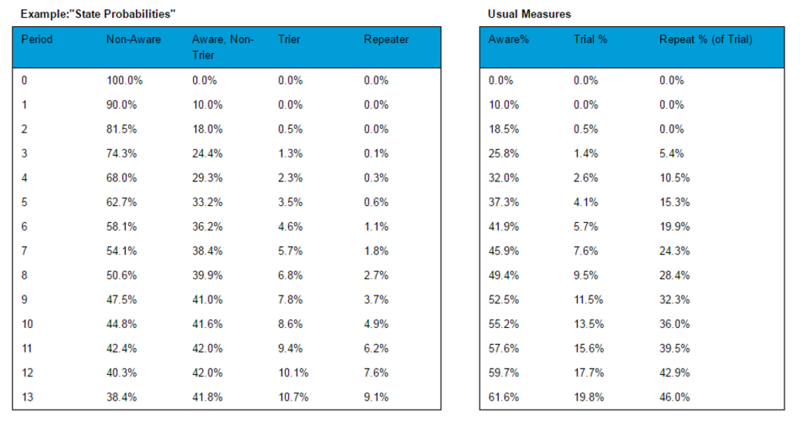 If you have Extended usage Option KM test results, you can run through Step 4 tool to obtain 2nd repeat choice share. 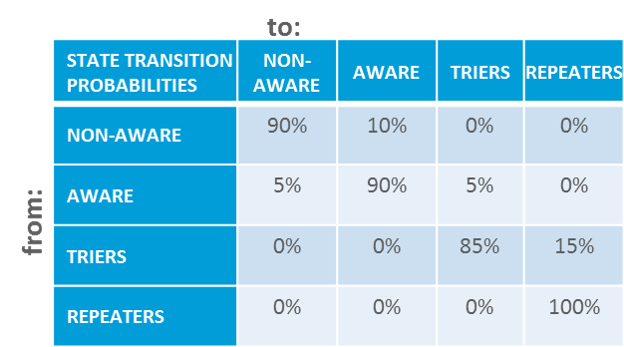 For New Items, everyone starts as "Non-Aware..."
Over time, driven by both internal factors and external factors, consumers progress from State 1…State 4 (or regress if they forget) based on a set of probabilities called the State Transition Probability. What factors drive consumers between states? What's the probability consumers will become aware of the product? Similar to the Global model, Gen-3 has an awareness sub-model to estimate the probability that a non-aware HH will become aware of the product. What is the probability aware consumers will forget? Without ‘reminders’, consumers may forget (become non-aware). The forgetting factor is similar to awareness decay in the Global Model. In Gen-3, we assume respondents who have purchased the product at least once will not forget the product. What's the probability consumers will try the product without previous media exposure? The probability of purchasing an item (which can occur in states Non-Aware Trial, Aware Trial or Repeat) is governed by two factors: Propensity and Opportunity. What's the probability consumers who are aware of the product will try? What's the probability consumers who have tried the product will repeat? Combining these factors gives us the State Transition Probabilities Table. 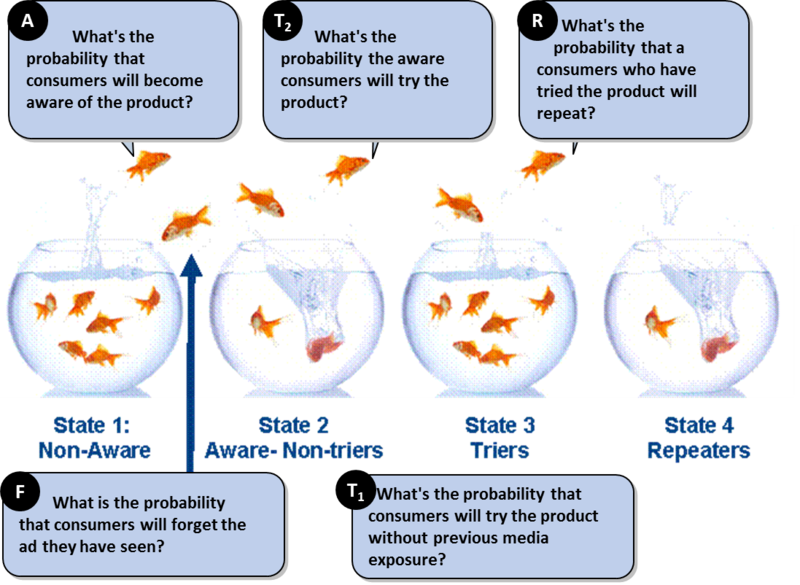 A= The probability that consumers will become aware of the product. F= The probability that consumers will forget. T1= The probability that consumers will try the product without previous media exposure. T2= The probability that consumers who are aware of the product will try. R= The probability that consumers who have tries the product will repeat. The Example demonstrates a State Probabilities Table for a new item. Using the State Transition Probability table we will isolate how a factor, for example Awareness Generation, is applied. Chart demonstrates a Homogeneous Awareness Build Curve. 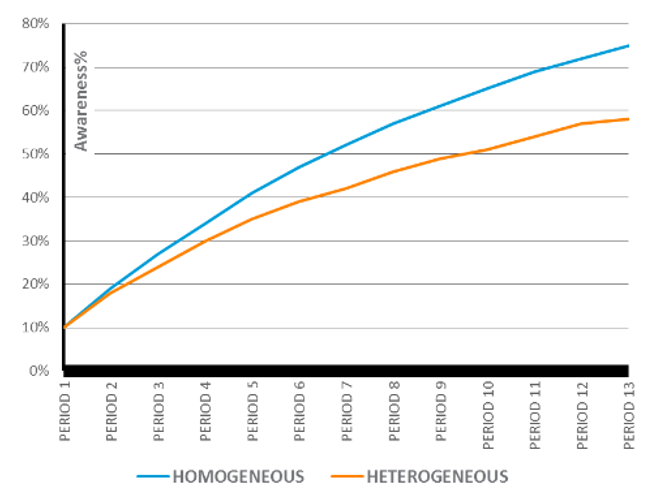 In this case, the awareness build is different … This chart provides comparison of Heterogeneous and Homogeneous Awareness build. Gen-3 divides households into small, homogeneous sub-groups (i.e. “Cohorts”) with similar characteristics relevant to buying behavior. When creating cohorts, we group Households with similar Awareness, Trial and Repeat probabilities together to apply the same state transition probabilities table within each cohort. Each Cohort is defined as a combination of levels of these drivers. 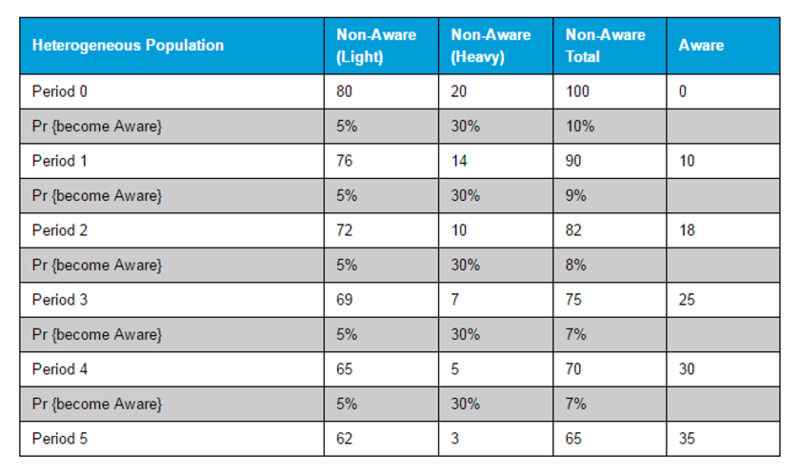 Households with similar Awareness, Trial, and Repeat probabilities are grouped, with a State Transition Probabilities table for each Cohort. The five criteria are divided into 4-5 groups, then 'crossed' (in a cross-tabulation) to form a cohort. The behavior of each cohort over time is then treated almost as if it were one individual, except that the individuals within a cohort can be spread across the different states: 1,…,4. Click each image to see criteria used to define Cohorts. We are ready to calculate volume. At launch of a new item All cohorts are assumed to be in State 1 ="non-aware" of the item. At Period (t) For each Cohort the State Transition Probability table is calculated, based on marketing variables at Period (t).The state transition probabilities table is unique for each cohort and each period. These Transition Probabilities are applied To the State Probabilities for the Cohort at the end of Period (t-1) to give the State Probabilities for the Cohort at the end of Period (t).Steps 2 and 3 are repeated for t = 1, 2, … as required. 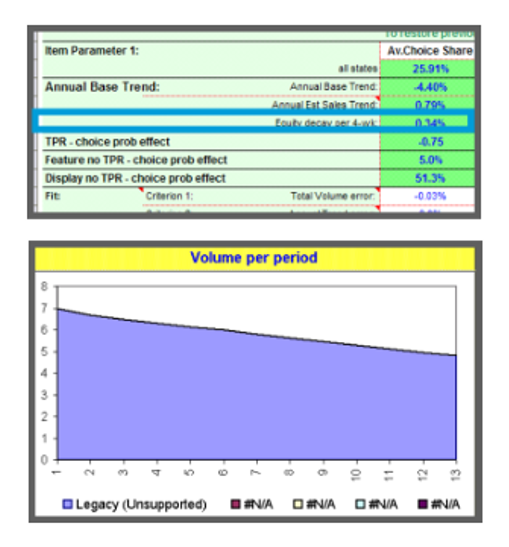 Volume is modeled separately for each Cohort Based on its unique state transition probabilities table for each period with results aggregated at the end.Because the model uses distributions such as NBD, it can calculate how many households there are at each level of media viewing, category purchase, item choice etc. Reported results are the aggregation of the cohorts Representing the population. ...results in Awareness Build and Trial and Repeat curves for the population, deriving usual measures. While we know a lot, it's important to pair this with heterogeneity. Calibrate/Customize the restager model to predict known past-year volume of the parent brand. Use the calibrated model to estimate volume for the restage. Click the launch sequence stages to learn more. In a restage study, we have historical by-period in-market sales data and marketing plan for the current cell. The model will run many times and readjust the settings so the calibrated results best fit the actual sales data. This iterative process is called auto-calibration. Choice shares for different states differ for new items. However, for established brands, since it is difficult to distinguish first time buyers from repeat buyers (and majority of consumers are repeat) we assume choice shares are the same for all states for the control estimate. While you may have entered buyers/non-buyers, concept/product choice shares, you will only see one calibrated choice share. 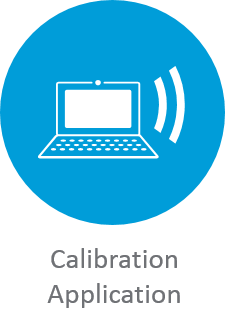 Gen-3 runs the forecast over & over to calibrate choice share with actual sales and marketing plans, therefore there is no need to wait for key measure scores to autocalibrate. As soon as you receive the marketing plan and historical sales, you are ready to calibrate! Since there is no change in concept proposition, the interim choice share remains the same as the current item. For a restage, non-aware consumers have a propensity to buy the Restage similarly to the Current line. 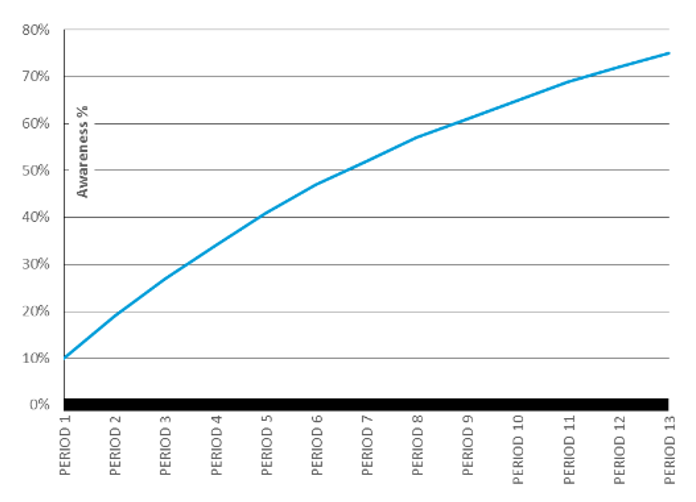 (Calibrated choice share for the period) x (Estimated trial (or repeat) choice share from Step 4 for restage vs. current). Through matching the by-period fluctuations in sales volume and the marketing plan, Gen-3 calibrates the marketing plan support for each cohort to move from states (e.g. from non-aware to aware, from aware to trial), thus the volume lift effect. In the restage forecast, the model uses the calibrated sensitivity with by-period marketing plans and the heterogeneity, to estimate the promotion lift effect of various marketing plan inputs. Without advertising, choice share tends to decline due to competitive pressure. Over time, due to competitive pressure, if a brand is left unsupported, the probability for consumers to buy your brand will decline. The choice share declines at a steady rate, leading to a decline in equity stock. We call this steady decay the equity decay rate. This can be seen in the following Gen-3. The auto-calibration process finds the equity decay rate that best fits final volume. The equity decay rates for the interim and the restage estimates are assumed to be the same as the control estimate. Without advertising support, the model assumes the choice share for current, interim and restage will all decline at the same rate. We need to be patient running auto-calibration, due to the amount of forecasts being run simultaneously. Using the NBD-Dirichlet theory to account for the heterogeneity, Gen-3 puts together the by-period marketing plan, the category dynamics and by-state information to generate a volume estimate!